Back to the story: It’s a beautiful day, so the sisters decide to walk home instead of taking the school bus. The story is set in a seaside village on the Black Sea, and their walk takes them by a beach. This leads to some playful frolicking in the water with their male friends. Oh, oh. The life the sisters had known is over now. Grandma (Nihal Koldas) gathers up their telephones, their computer, confiscates books, makeup, and any other thing that might have a pernicious influence, and locks all of it in a cupboard. The sisters are driven to a local clinic and made to suffer the indignity of virginity tests. Their home becomes a “wife factory.” Neighbourhood women in headscarves come in to instruct them in sewing, stuffing a duvet, cooking (they even make chewing gum!) and advanced window cleaning. They must wear muddy-coloured, long-sleeved dresses. Sometimes when the family is just hanging out, we can hear speeches on the TV about how women ought to behave. Before we know it, the two oldest girls, Sonay (Ilayda Akdogan) and Selma (Tugba Sunguroglu), are serving coffee and cookies to the neighbourhood women. It’s a sort of an audition, or presentation of the merchandise, really. A woman will offer a son as a groom, then bring her husband in, that very same day, to confirm the engagement, with rings and red ribbons. The wishes and opinions of the future partners don’t seem to matter. At least Sonay manages to get engaged to the guy she’s already been seeing on the sly. Selma is not so lucky; she’s paired off with a guy who looks just as unenthusiastic as she does. After this outing, the walls around the house are made higher still, a tall wrought-iron gate is installed and bars are placed on the windows. The place really feels like a prison, now. However, all this “security” will come in mighty handy for some of the sisters later. To my shock and surprise, when school starts again, none of the girls are allowed to return. (The actress playing Lale was 13 in real life, but she looked younger than that to me. I’m not sure how old she was supposed to be in the story.) No one comes to find out why they aren’t in school. Throughout the film Lale has been watching, without saying a lot, but it’s obvious that she’s in no hurry to become a housewife. She’s plotting to rescue herself and her remaining single-but-already-engaged sister and we get to be a part of it. She might be young, but she’s very resourceful and she’s already found a good ally on “the outside.” An ally, mind you, not a prince or a knight, because she is not a helpless girl. While some parts of the film are upsetting, maddening, even tragic, the bond the sisters have is wonderful to behold. Viewers who don’t have any sisters might well wish that they did. The actresses are so comfortable together they are very believable as sisters. Outdoors, they do gallop like mustangs, but at home they might tumble around playfully, or cuddle up together, like a bunch of kittens. Hundreds of teenagers auditioned for parts in the film. Elit Iscan (Ece) was only one with previous acting experience, though you wouldn’t know it. Director Deniz Gamze Ergüven first saw Tugba Sunguroglu (Selma) on an airplane flight. Ergüven was born in Turkey but she’s based in France now. She often moved between France and Turkey, and also spent time in the U.S. and in South Africa, where she earned an M.A. in African History. The film was shot in the Black Sea village of Inebolu. It is 600 km from Istanbul, though in the story the sisters are 1,000 km from the big city. For them, it probably seems as far away as the moon. 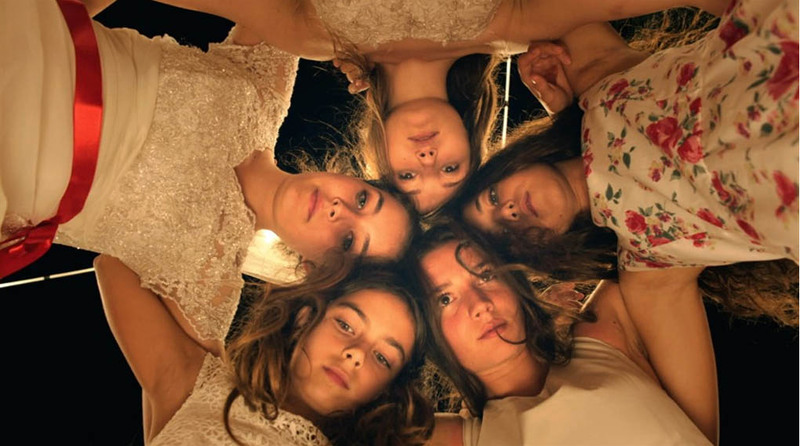 Mustang was written by Deniz Gamze Ergüven and Alice Winocour. I really enjoyed the film’s sound track. Most of the tunes were composed by Australian musician Warren Ellis, of Nick Cave and the Bad Seeds. Three tunes (or fragments of them) that Ellis recorded with Cave are in the film, though they are not on the Mustang sound track album. Those tunes are Home, Moving On, The Mother. Of the 12 tracks on the album ($9.99) 11 are by Warren Ellis, and one is from the Turkish band Baba Zula. (Here is a link to the Mustang soundtrack, at iTunes.) Coincidentally, Baba Zula played here in Montreal in October, 2015. Two other tunes, Yüksek Yüksek Tepeler (The Song of a Homesick Bride), performed by Selim Sesler, and Esrefoglu Hear My Words (Eyefoölu Al Haberi) performed by Ahmet (Dede) Yurt, are in the film, but not on the soundtrack. I think their tunes provided the lively dance music at a wedding reception. (Selim Sesler’s music is here, on iTunes; there’s a video of Ahmet Yurt on YouTube. 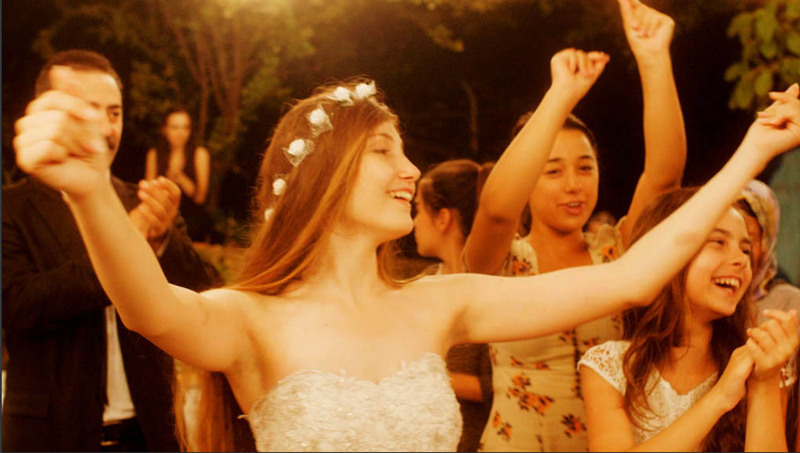 Mustang is a France-Turkey-Germany co-production For those who care about such things, Mustang is France’s entry for the foreign-language Oscar. Mustang is in Turkish. In Montreal a version with English subtitles is being shown at Cinéma du Parc and Cineplex Forum. The version with French subtitles is being shown at Cinéma Beaubien, Cineplex Odeon Quartier Latin, and Méga Plex Pont Viau.